by Chris Woodford. Last updated: June 18, 2018. Imagine if your memory worked only while you were awake. Every morning when you got up, your mind would be completely blank! You'd have to relearn everything you ever knew before you could do anything. It sounds like a nightmare, but it's exactly the problem computers have. Ordinary computer chips "forget" everything (lose their entire contents) when the power is switched off. Large personal computers get around this by having powerful magnetic memories called hard drives, which can remember things whether the power is on or off. But smaller, more portable devices, such as digital cameras and MP3 players, need smaller and more portable memories. They use special chips called flash memories to store information permanently. Flash memories are clever—but rather complex too. How exactly do they work? 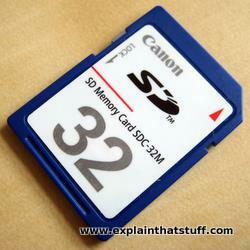 Photo: A typical secure digital (SD) card from a digital camera. Inside, there's a flash memory chip. How does it work? Read on! Computers are electronic machines that process information in digital format. Instead of understanding words and numbers, as people do, they change those words and numbers into strings of zeros and ones called binary (sometimes referred to as "binary code"). Inside a computer, a single letter "A" is stored as eight binary numbers: 01000001. In fact, all the basic characters on your keyboard (the letters A–Z in upper and lower case, the numbers 0–9, and the symbols) can be represented with different combinations of just eight binary numbers. A question mark (?) is stored as 00111111, a number 7 as 00110111, and a left bracket ([) as 01011011. Virtually all computers know how to represent information with this "code," because it's an agreed, worldwide standard. It's called ASCII (American Standard Code for Information Interchange). You can figure out that I am sending you the binary number 00110111, equivalent to the decimal number 55, and so signaling the character "7" in ASCII. What does this have to do with memory? It shows that you can store, or represent, a character like "7" with something like a flag that can be in two places, either up or down. A computer memory is effectively a giant box of billions and billions of flags, each of which can be either up or down. They're not really flags, though—they are microscopic switches called transistors that can be either on or off. It takes eight switches to store a character like A, 7, or [. It takes one transistor to store each binary digit (which is called a bit). In most computers, eight of these bits are collectively called a byte. So when you hear people say a computer has so many megabytes of memory, it means it can store roughly that many million characters of information (mega means million; giga means thousand million or billion). 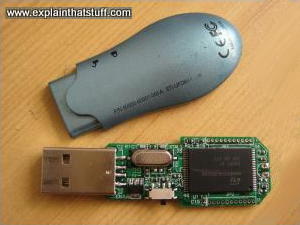 Photo: A typical USB memory stick—and the flash memory chip you'll find inside if you take it apart (the large black rectangle on the right). Ordinary transistors are electronic switches turned on or off by electricity—and that's both their strength and their weakness. It's a strength, because it means a computer can store information simply by passing patterns of electricity through its memory circuits. But it's a weakness too, because as soon as the power is turned off, all the transistors revert to their original states—and the computer loses all the information it has stored. It's like a giant attack of electronic amnesia! Photo: Apple iPods, past and present. The white one on the left is an old-style classic iPod with a 20GB hard drive memory. The newer black model on the right has a 32GB flash memory, which makes it lighter, thinner, more robust (less likely to die if you drop it), and less power hungry. Memory that "forgets" when the power goes off is called Random Access Memory (RAM). There is another kind of memory called Read-Only Memory (ROM) that doesn't suffer from this problem. ROM chips are pre-stored with information when they are manufactured, so they don't "forget" what they know when the power is switched on and off. However, the information they store is there permanently: they can never be rewritten again. In practice, a computer uses a mixture of different kinds of memory for different purposes. The things it needs to remember all the time—like what to do when you first switch it on—are stored on ROM chips. When you're working on your computer and it needs temporary memory for processing things, it uses RAM chips; it doesn't matter that this information is lost later. Information you want a computer to remember indefinitely is stored on its hard drive. It takes longer to read and write information from a hard drive than from memory chips, so hard drives are not generally used as temporary memory. In gadgets like digital cameras and small MP3 players, flash memory is used instead of a hard drive. It has certain things in common with both RAM and ROM. Like ROM, it remembers information when the power is off; like RAM, it can be erased and rewritten over and over again. Photo: Turn a digital camera's flash memory card over and you can see the electrical contacts that let the camera connect to the memory chip inside the protective plastic case. Flash works using an entirely different kind of transistor that stays switched on (or switched off) even when the power is turned off. 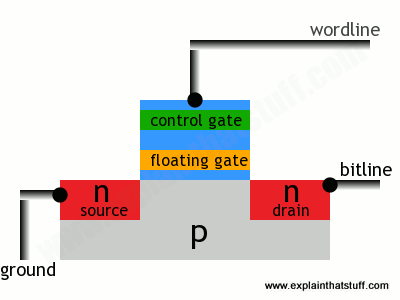 A normal transistor has three connections (wires that control it) called the source, drain, and gate. Think of a transistor as a pipe through which electricity can flow as though it's water. One end of the pipe (where the water flows in) is called the source—think of that as a tap or faucet. The other end of the pipe is called the drain—where the water drains out and flows away. In between the source and drain, blocking the pipe, there's a gate. When the gate is closed, the pipe is shut off, no electricity can flow and the transistor is off. In this state, the transistor stores a zero. When the gate is opened, electricity flows, the transistor is on, and it stores a one. But when the power is turned off, the transistor switches off too. When you switch the power back on, the transistor is still off, and since you can't know whether it was on or off before the power was removed, you can see why we say it "forgets" any information it stores. A flash transistor is different because it has a second gate above the first one. When the gate opens, some electricity leaks up the first gate and stays there, in between the first gate and the second one, recording a number one. Even if the power is turned off, the electricity is still there between the two gates. That's how the transistor stores its information whether the power is on or off. The information can be erased by making the "trapped electricity" drain back down again. That's a very glossed over, highly simplified explanation of something that's extremely complex. If you want more detail, it helps if you read our article about transistors first, especially the bit at the bottom about MOSFETs—and then read on. 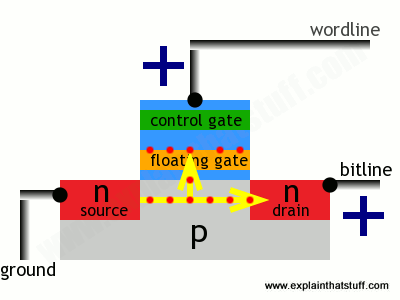 The presence of electrons on the floating gate is how a flash transistor stores a one. The electrons will stay there indefinitely, even when the positive voltages are removed and whether there is power supplied to the circuit or not. The electrons can be flushed out by putting a negative voltage on the wordline—which repels the electrons back the way they came, clearing the floating gate and making the transistor store a zero again. Not an easy process to understand, but that's how flash memory works its magic! How long does flash memory last? Flash memory eventually wears out because its floating gates take longer to work after they've been used a certain number of times. It's very widely quoted that flash memory degrades after it's been written and rewritten about "10,000 times," but that's misleading. According to a 1990s flash patent by Steven Wells of Intel, "although switching begins to take longer after approximately ten thousand switching operations, approximately one hundred thousand switching operations are required before the extended switching time has any affect on system operation." Whether it's 10,000 or 100,000, it's usually fine for a USB stick or the SD memory card in a digital camera you use once a week, but less satisfactory for the main storage in a computer, cellphone, or other gadget that's in daily use for years on end. One practical way around the limit is for the operating system to ensure that different bits of flash memory are used each time information is erased and stored (technically, this is called wear-leveling), so no bit is erased too often. 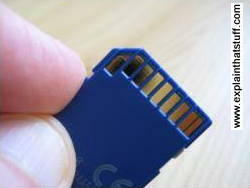 In practice, modern computers might simply ignore and "tiptoe round" the bad parts of a flash memory chip, just like they can ignore bad sectors on a hard drive, so the real practical lifetime limit of flash drives is much higher: somewhere between 10,000 and 1 million cycles. Cutting-edge flash devices have been demonstrated that survive for 100 million cycles or more. Flash was originally developed by Toshiba electrical engineer Fujio Masuoka, who filed US Patent 4,531,203 on the idea with colleague Hisakazu Iizuka back in 1981. Originally known as simultaneously erasable EEPROM (Electrically Erasable Programmable Read-Only Memory), it earned the nickname "flash" because it could be instantly erased and reprogrammed—as fast as a camera flash. At that time, state-of-the-art erasable memory chips (ordinary EPROMS) took 20 minutes or so to wipe for reuse with a beam of ultraviolet light, which meant they needed expensive, light-transparent packaging. Cheaper, electrically erasable EPROMS did exist, but used a bulkier and less efficient design that required two transistors to store each bit of information. Flash memory solved these problems. Toshiba released the first flash chips in 1987, but most of us didn't come across the technology for another decade or so, after SD memory cards first appeared in 1999 (jointly supported by Toshiba, Matsushita, and SanDisk). SD cards allowed digital cameras to record hundreds of photos and made them far more useful than older film cameras, which were limited to taking about 24–36 pictures at a time. Toshiba launched the first digital music player using an SD card the following year. 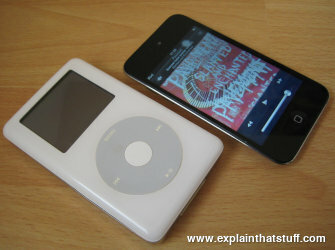 It took Apple a few more years to catch up and fully embrace flash technology in its own digital music player, the iPod. Early "classic" iPods all used hard drives, but the release of the tiny iPod Shuffle in 2005 marked the beginning of a gradual switchover, and all modern iPods and iPhones now use flash memory instead. Flash Memory Integration: Performance and Energy Issues by Jalil Boukhobza, Pierre Olivier. Elsevier, 2017. How can we make flash chips work faster with less energy? Flash memories by Paulo Cappelletti et al (eds). Springer, 1999/2013. A solid technical introduction. Nonvolatile Memory Technologies with Emphasis on Flash: A Comprehensive Guide to Understanding and Using Flash Memory Devices by Joe Brewer and Manzur Gill (eds). John Wiley and Sons, 2008. Covers all aspects of flash memory chips, including how they're made, how they work, and their various applications. Nonvolatile Semiconductor Memory Technology: A Comprehensive Guide to Understanding and to Using NVSM Devices by William D. Brown and Joe E. Brewer (eds). IEEE Press, 1998. That New Memory Smell: Tech Can Tell if Your Flash is New or Recycled by Samuel K. Moore. IEEE Spectrum, 4 May 2018. Engineers have found a way to detect if old flash memory is being used in new devices. Flashristors: Getting the Best of Memristors and Flash Memory: IEEE Spectrum, 22 June 2015. A new type of memory device combines the memory effect of memristors with the longer life of flash memory. Glasgow University 'solution' to flash memory limit: BBC News, 20 November 2014. A new type of flash memory could boost storage limits by using polyoxometalate molecules to replace semiconductors. Are Multiferroics the Ultimate Replacement for Flash Memory? : IEEE Spectrum, 22 September 2014. Multiferroic materials that combine magnetic and ferroelectric properties are being hailed as a possible flash replacement. Flash Memory Survives 100 Million Cycles by Yu-Tzu Chiu. IEEE Spectrum, December 2012. Conventional flash memories can wear out after just 10,000 read-write operations, but a new improved version, treated with heat, might last 100 million cycles or more. Flash Drives Replace Disks at Amazon, Facebook, Dropbox by Cade Metze. Wired, 13 June 2012. How flash is being used to store the stuff we upload to social networking and cloud-based sites. Meet Gordon, the World’s First Flash Supercomputer by Marty Graham. Wired, 9 December 2011. Describes a new Californian supercomputer built from 300 terabytes of flash memory chips! New ultra high density EPROM and flash EEPROM with NAND structure cell by F. Masuoka et al, Toshiba Corporation, IEEE International Electron Devices Meeting (IEDM), 1987. Toshiba's original paper describing modern NAND flash memory. US 4,531,203: Semiconductor memory device and method for manufacturing the same by Fujio Masuoka and Hisakazu Iizuka. Toshiba., July 23, 1985. Masuoka's original flash memory patent. US 5,404,485: Flash memory mass storage architecture by Mahmud Assar et al. Cirrus Logic, Inc., February 7, 1995. How flash memory can be substituted for a hard disk. US 5,404,485: Flash file system by Amir Ban. M-Systems Flash Disk Pioneers Ltd, April 4, 1995. Describes the architecture of a typical flash memory system. US Patent: 5,341,339: Method for wear leveling in a flash EEPROM memory by Steven Wells. Intel, August 23, 1994. Describes an effective way of "extending significantly the life of a flash memory" through wear leveling. US Patent: 6,732,221: Wear leveling of static areas in flash memory by Amir Ban. M-Systems Flash Disk Pioneers Ltd, May 4, 2004. An improved wear-leveling method that avoids static areas.